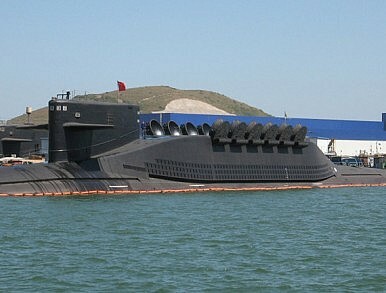 A Type 094 Chinese SSBN. China’s nuclear modernization continues with the first known test of its next-generation SLBM. On November 24, the Chinese People’s Liberation Army-Navy conducted the first known flight-test of the JL-3 solid-fuel, submarine-launched ballistic missile (SLBM), U.S. government sources with knowledge of the test confirmed to The Diplomat. The test, which was first reported by the Washington Free Beacon, took place in the Bohai Sea from a modified conventional submarine, the sources said. The Type 096 nuclear ballistic missile submarine (SSBN) remains under construction and is expected to begin sea trials in three to four years. Chinese authorities have not publicly confirmed the test. The JL-3, along with the Type 096, will mark the modernization of China’s sea-based nuclear deterrent, which became operational only recently. Currently, Beijing is known to operate at least four, but possibly as many as six, Type 094 SSBNs armed with the JL-2 SLBM—an SLBM based off the land-based DF-31 solid-fuel intercontinental-range ballistic missile. The range of the JL-3, meanwhile, would allow Chinese submarines to strike at continental U.S. targets from further away, increasing their survivability by reducing the need to navigate into contested waters in the Western Pacific in a conflict, for example. “China’s four operational JIN-class SSBNs represent China’s first credible, seabased nuclear deterrent,” the U.S. Department of Defense’s 2018 report on Chinese military power noted. “China’s next-generation Type 096 SSBN, reportedly to be armed with the follow-on JL-3 SLBM, will likely begin construction in the early-2020s,” it added.